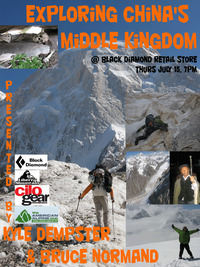 Where: Black Diamond Retail Store 2084 E 3900 S, Salt Lake City, UT. 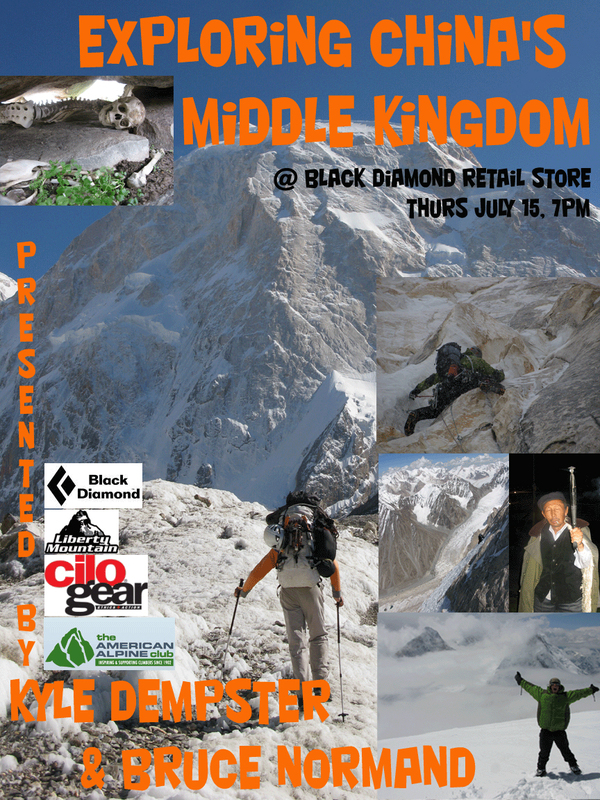 At 7:00pm on July 15, Piolets d’Or winners Kyle Dempster and Bruce Normand will present a slide show on their climb in China’s Middle Kingdom. Dempster, Normand, and Jed Brown did the first ascent of Xuelian West (6,422m). The three men completed an alpine-style ascent of the 2,650-meter north face during a five-day round trip. Their route, the Great White Jade Heist, went at M6 WI5 5.7 R. Xuelian West is a satellite of 6,627-meter Xuelian, which has only been climbed once. You are currently browsing the Utahclimbers.com blog archives for July, 2010.